Put a small amount of Multipurpose Liquid Glue on a Silicone Craft Sheet, and pick up with a portion of a Stampin’ Sponge to put on the back of the die cut Night of Navy cardstock. Adhere onto the Whisper White cardstock, then to the cardfront. Stamp sentiment onto scrap Whisper White cardstock and die cut with Oval framelit. Adhere sentiment onto cardfront with Stampin’ Dimensionals. Die cut scrap of Whisper White with Blizzard Thinlits die and adhere a few snowflakes onto the sentiment. If desired, add a second piece of Whisper White cardstock to the inside of the card. 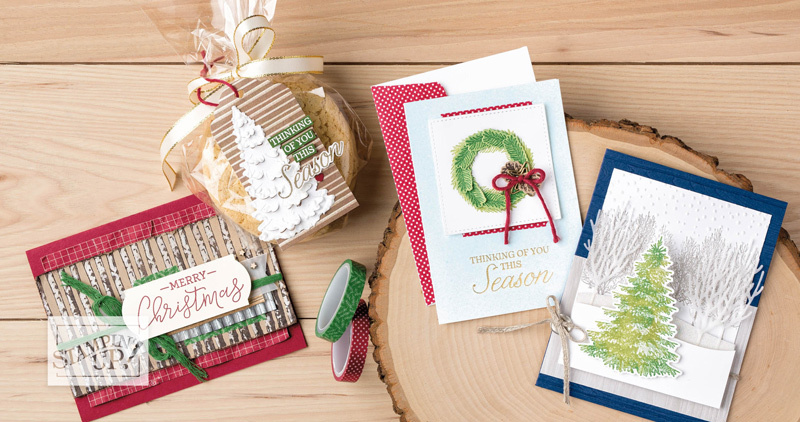 Tags: beautiful blizzard, big shot, Holiday Catalog, layering ovals, stamp with tammy, stampin' up! They are great for scene building and are easy to pair with all kinds of imagery. We have a bundle being released in our upcoming 2018 Holiday Catalog that I'm sure you are going to appreciate. In this bundle you have the Winter Woods red rubber stamp set with seven individual stamps, and the In the Woods Framelits Dies that comes with 11 different coordinating dies. The stamp set imagery really highlights the quality of Stampin' Up! red rubber stamps with the really fine intricate details in the branches and textures of the trees. The stamp set features versatile classic tree images and one sentiment that would be lovely for your Christmas season projects or it also works for other non seasonal projects too. with some of our current favorites. Check back on September 5th to see all the new products for the upcoming season. PLACE A PRODUCT ORDER OF $75 or more (before shipping and tax) in my ONLINE STORE this month and you can earn the Mini Stampin' Dimensionals! $75 – $149.99 ORDER: ADD HOST CODE, U4DYGUR4 for orders of $75 or more and under $150 (before tax and shipping). To claim your bonus gift from me, you MUST include this host code. Example below on where to add your host code when ordering on-line. IMPORTANT NOTE: Your FREE gifts are mailed separately from your order and will arrive mid-month (October) following when it was earned. If the gift of the month is on on back order or is discontinued, I will replace it with an item of equal or greater value. Add items to your shopping bag. Click the shopping bag link. Enter the host code (U4DYGUR4) in the box, then click apply. Please be sure you are adding the host code to the host code field and not the coupon code field (see screen shot below).